I rarely cook pork, but this particular night I went to the grocery store, they didn’t have any chicken breast (imagine that!) so I picked up these pork chops instead. 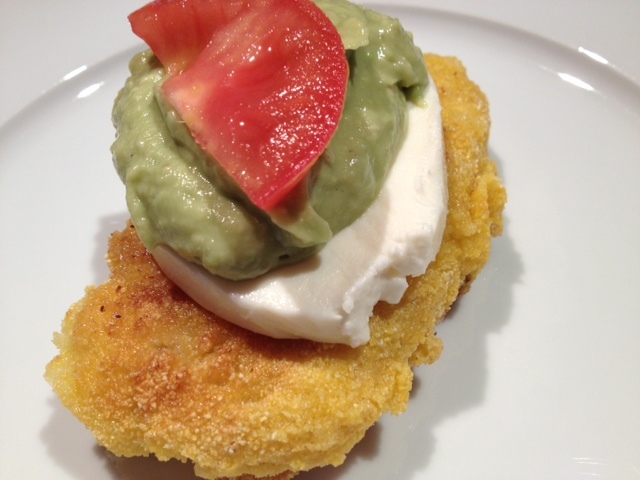 This recipe could certainly be cooked with chicken breast instead of pork if you prefer, but I think that the pork gives it a unique flavor and texture that combines amazingly with the crunchiness of the corn meal, the tartness of the lemon and the smoothness of the avocado and mozzarella. Delish! Begin my marinating the pork chops with the juice from 1 lemon and a dash of garlic salt and hot red pepper flakes. Allow them to sit in the lemon juice for about 30 minutes. After marinated, bread the pork chops by coating them in egg and then coating them in corn meal. After the pork chops are breaded, heat the olive oil in a non-stick pan on medium-high heat. It’s important that the pan is non-stick because the breading on the pork is fairly delicate. Cook the pork in the oil on each side for about 1-2 minutes until golden brown. If the oil begins to smoke, make sure to turn the heat down. Place the pork chops on a non-stick baking sheet and bake in a 350 degree oven for 10 minutes. 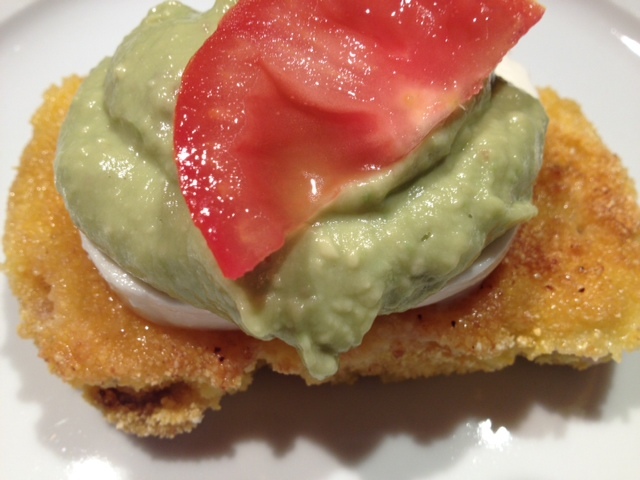 While the pork chops are in the oven, add the avocado and the juice from 1/2 a lemon into the food processor. Add a dash of garlic salt and hot red pepper flakes and blend until smooth. 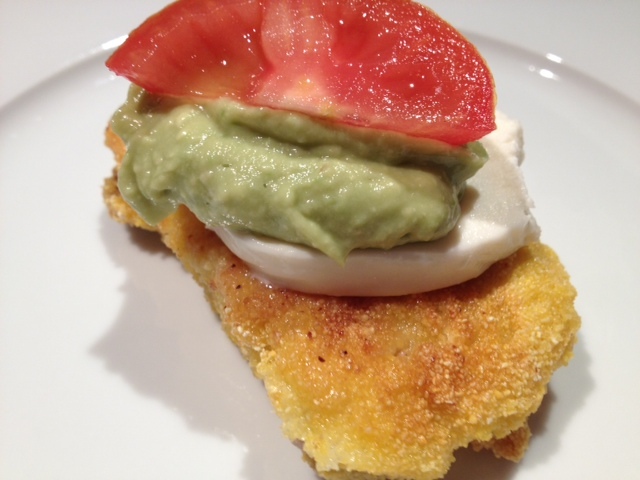 After the pork chops are done baking, plate the pork and then top with a slice of fresh mozzarella, a spoonful of the avocado puree and a slice of tomato. Squeeze a bit of lemon juice over the top to enhance the lemon flavor.